a big basket – a bit of a luxury request, I envision I’ll be shopping a bit with this pram, and I don’t fancy trying to steer a pram and a trolley at the same time! colour – another luxury, but I want to be able to identify my pram in a pack! a big canopy – Grub is due in November, so early use is going to be in the peak of summer. additional seat capacity – so that if we have another baby at some point, the pram will adjust to suit our needs. Steelcraft Strider Compact: We loved, loved, loved this one. Almost everything was exactly as we were after, including foam filled wheels in the 2015 edition. Our only annoyance was that the seat didn’t lay flat. It had absolutely everything else. I was dubious about the Compact over the Plus model, but after seeing the sizes side by side (the Compact is 7cm narrower), it really did make a difference. Valco Rebel Q Air: I was sold on the Rebel Q from the beginning, after reading about it and researching it online. Again, it had pretty much everything on my list, including the ability to lay the seat completely flat. Mr Nester and I checked it out in store, pretty much expecting to walk away with one, and, well, I wasn’t that enamoured. While it had everything we were after, the folding mechanism was fiddly, and I kept catching my hand in it. The shade cover came up at the back when I pulled the front forward, which was really annoying. The different seat positions didn’t seem to click well into place, and the peekaboo window (who’d have thought that was a consideration?) was a very noisy velcro. I so wanted this pram to be the one, but unfortunately for us it wasn’t. 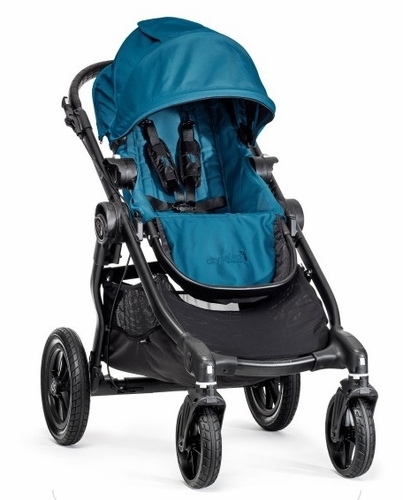 Uppababy Alta (or Cruz in the US): This one was a surprise – we saw it at the doctor’s a couple of weeks ago, and it wowed both Mr Nester and I straight away. It seemed to have everything we were after, looked light, easy to manoeuvre, and was an awesome colour. I immediately went home and looked it up, and it does look fantastic. Again, it ticks most of the boxes, however the one flaw was that the Alta is only a single pram. No way of adding a second seat. For that, you need the Vista, and with a retail price of about $1500, it was well out of our range. I was a bit gutted by this one. Baby Jogger City Select: This one has been winning all the awards this year, and last year. It’s a hot favourite at the moment, and I can understand why. It again ticks most of the boxes, with the exception of the lay flat seat. My issue with the City Select is firstly the price ($800+, depending on where you buy), and secondly the brake. You’d think that would be fairly straightforward, especially in an award-winning pram, but it’s the only one I’ve seen that is a hand brake, and not a foot brake. It also requires a couple of steps to lock or unlock, which for some reason just annoyed the hell out of me! Once again my big hands kept getting caught, so this one was also crossed off the list. In the end, it was a tough decision, but we chose the Strider Compact. It really was everything we were after, and even after putting it through its paces at the store, both Mr Nester and I were impressed with it. The bonus with this one was that a friend is giving us a capsule for the car, and it’s compatible with this pram. That means that the issue of the lie-flat seat is now not an issue, and so the Strider ticks all the boxes. Which is why I just ordered one. In the most delicious teal colour. I can’t wait! Ooo, exciting, the teal is lovely. Well done for your mum getting you such a thoughtful and useful gift too!